ITC Infotech hosted the second version of its flagship event called ‘iTech 2016’, the annual technology innovation & co-creation platform aimed at promoting entrepreneurship at its campus in Bengaluru. ITC Infotech hosted the second version of its flagship event called ‘iTech 2016’, the annual technology innovation & co-creation platform aimed at promoting entrepreneurship at its campus in Bengaluru. 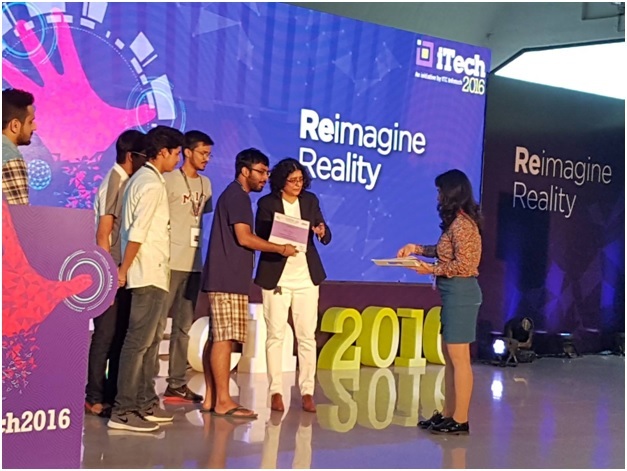 They organised a 30-hour hackathon on augmented reality (AR) and virtual reality (VR) on July 16th-17th , which was won by a team of four students from SRM University - Anshuman Pandey, Aditthya Ramakrishnan, Rohan Pooniwala and Raghav Gupta. For the first time a student team won this prestigious hackathon beating professional teams that came from all over India. There were also established AR/VR startups that participated in the hackathon. Over 1700+ teams applied for the event, and only 45 teams were called for the final round. The team from SRM University made its way through to the Top 5 teams that were asked to demo their work after hackathon. The jury had a hard time choosing the winners and decided to award 7 special mention awards for innovation apart from the top 5. The team from SRM emerged as the winners and took home a hefty cash prize of Rs 3 lakhs, given to them by Ms. Sushma Rajagopalan, MD and CEO - ITC Infotech. The hackathon provided participants with an opportunity to develop their ideas into prototypes, addressing a host of crowd-sourced business challenges from the Manufacturing, Consumer Goods, Retail, Hospitality, Education & Stationery Products, Banking, Financial Services & Insurance and Agriculture sectors. The Winning team from SRM University, created a mixed reality smartphone app, ‘NOMI’ which is their short form of ‘Know Me!’. Their app would re-define the shopping experience in stores and online. The team used Vuforia and Unity to develop the app and powered it with artificial intelligence and advanced machine learning capabilities. NOMI creates an immersive and interactive AR and VR environment to assist customers choose the right product by showing users all they need to know about a product from its nutritional facts to pricing range. They also allowed the users of the app to choose among the alternatives of a product along with real time news related to the product. “We took the use case of a consumer who is unaware about the effects of a product on his or her health and developed an app that could provide them with all the information they need related to it.” said Anshuman Pandey of the winning team. The panel of judges consisted of business leaders from ITC Infotech’s partners and global clients, such as KONE, BAT, Microsoft, PTC and SAP Labs along with senior leaders from ITC’s businesses. All the members of the wining team were offered a number of opportunities at the end of the hackathon event. The team from SRM University comprised of members of the Next Tech Lab. Anshuman and Aditthya had started the lab in January 2016 after returning from a semester at the Massachusetts Institute of Technology, where they had interned at the MIT Media Lab. Rohan and Raghav are founding members of the Minsky (Artificial Intelligence) and Mixed reality groups at Next Tech Lab. They had also developed the app SRM VR (available on the Google Play store) at Next Tech. When asked about the strategy they had in mind, Aditthya Ramakrishnan said - 'In our app, we render all the graphics and panels in real-time. There is no lag in fetching real time news or generating recommendations. This can be used by anyone with a smartphone and a decent Internet plan. I think that set us apart from the tough competition we had from other teams that used technology or equipment with less market penetration - such as Oculus Rift or Leap Motion. Our usage of bleeding edge technology like deep learning also helped'. The team has been approached by VCs and investors due to the market viability of their winning idea. The fact that a student team won a national hackathon beating established professionals has served as an inspiration to students of SRM University. The team from Next Tech Lab has only just begun. With many accomplishments behind them, they're always looking for the next big thing, aptly represented in their motto 'What's Next? '.